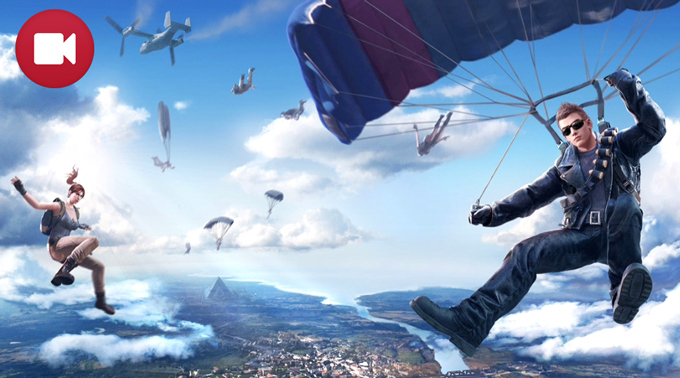 Rules of Survival is a popular game that you can play on Android and iOS devices. You may want to record the gameplay to make a tutorial video guide, to share some games tricks with other gamers, or even keep it as a record for future view. To do this, you need a screen recording tool. However, the one you need should not have any time or size limits or watermarks on the recorded video, which makes it hard to find a good tool to record Rules of Survival. Here we list some practical tools for you to do this. 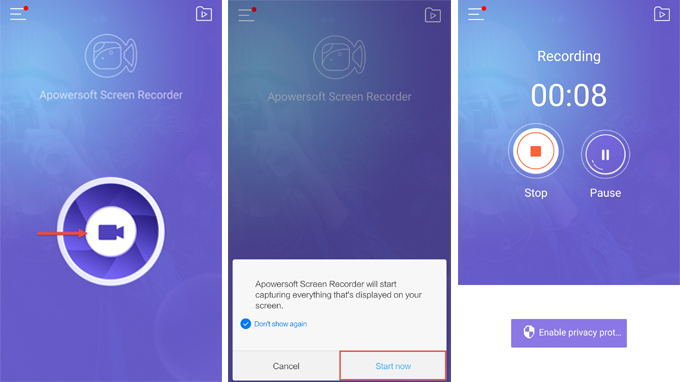 Apowersoft Screen Recorder is a free screen recording tool for Android. It has a clean interface and can be used to capture your phone screen activities. After recording, you are allowed to edit your recorded video by cropping the video or adding texts to it, and you can also share the gameplay recording with your friends. Aside from its recording function, this tool can also help to mirror your phone screen to PC, thus you can enjoy playing your game on a bigger screen. 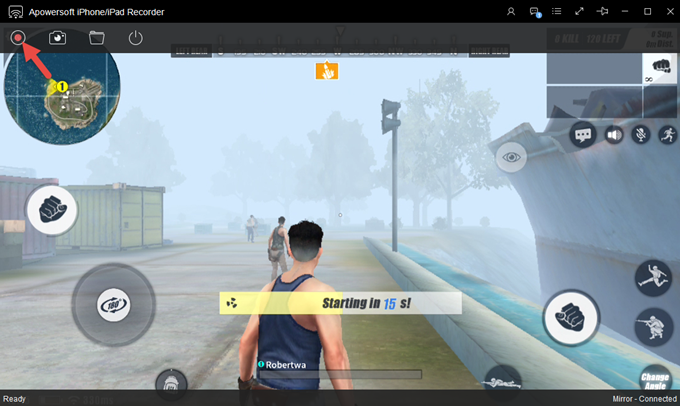 Proceed to see how to record Rules of Survival with this screen recorder. Get this app from Google Play Store. Launch Apowersoft Screen Recorder on your Android and make some configurations. Click the menu button on the top left of the interface, then go to “Settings” to configure it. You can tap to change the control and recording settings including the options to record sound, shake to record, show touches or overlay icon, etc. If you need to record webcam along with your phone screen, just tap to activate this function. Go back to the recording interface, and tap the camera icon to start recording. Click “Start now” if there is a window popping up by saying that “Apowersoft Screen Recorder will start capturing everything that’s displayed on your screen”. Once done settings, open the game of Rules of Survival and start playing it. Once done recording, enter the recorder’s main interface and hit the stop button to end the recording. You can also tap the stop button on the overplay icon if you have open the overplay icon. You can check your recorded file on the file list. You can tap to view the video, click the edit button to edit it, or share it with others. Note: In order to record the sound of the gameplay, please do not use a microphone. For those who have iOS devices with iOS 11 or later, ApowerREC will be your best choice. 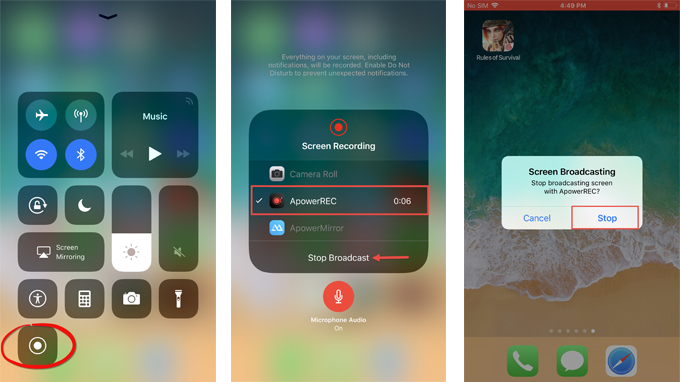 ApowerREC is a free tool that can be used to record iOS 11 screen, and it can record audio along with the video. Besides, you can save the recorded video to local Photos, or share it directly with your friends. 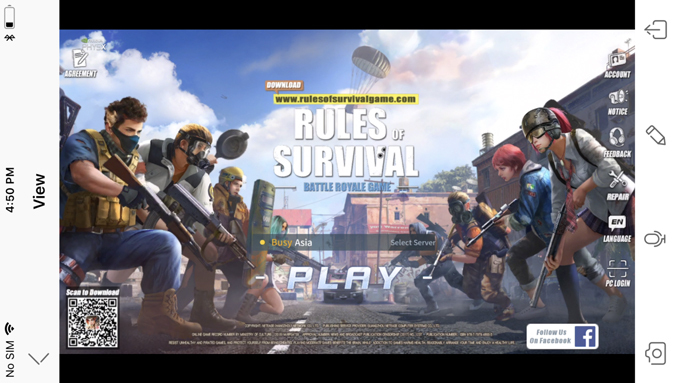 Here is how you can use this Rules of Survival recorder. On your iOS device, go to “Settings” > “Control Center” > “Customize Controls”. Find the “Screen Recording” feature and tap the “+” button to add it to the Control Center. Swipe up the Control Center, firmly tap the screen recorder icon to choose “ApowerREC” and click “Start Broadcast” to start recording your iPhone screen. Open the microphone to record sound if you want. Open Rules of Survival and start playing, then the gameplay will be recorded. Once you finished your gameplay, tap the red recording bar on the top of your phone screen to stop recording, or you can stop it from the control center. Then your file will be saved to ApowerREC file folder. You can open the app to view and edit your recording. If your iOS device is iOS 10 or previous version, then you can use iPhone/iPad Recorder to record Rules of Survival gameplay. This is a PC program, which makes use of the airplay mirroring function of iPhone/iPad to mirror your iOS device to PC and record your iPhone/iPad screen on PC. Here is a simple guide on how to use this tool. Connect your iPhone/iPad and your PC to the same WiFi network to make sure that your phone can be connected to PC successfully. 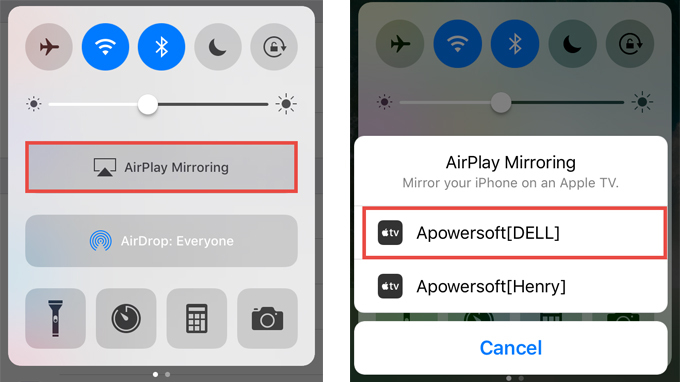 On your iOS device, swipe up to control center, tap “AirPlay Mirroring”, and search for a device beginning with “Apowersoft”. Then tap the device name to connect. Afterwards, your iPhone/iPad screen will be mirrored to PC immediately. Then on your iPhone/iPad, open the game Rules of Survival and play it. Click the record button on the top left of the program interface to start recording. Then you will have your gameplay recorded. Once done, click the stop recording button, and the file will be saved to your PC automatically. You can check it immediately. Recording a gameplay is a convenient way to show your own tricks in playing a game. When it comes to Rules of Survival, a game on Android and iOS, you can keep your gameplay experience by recording it. The above-mentioned ways are useful to record Rules of Survival gameplay. You can choose the one that fits your needs and phone operating system most.